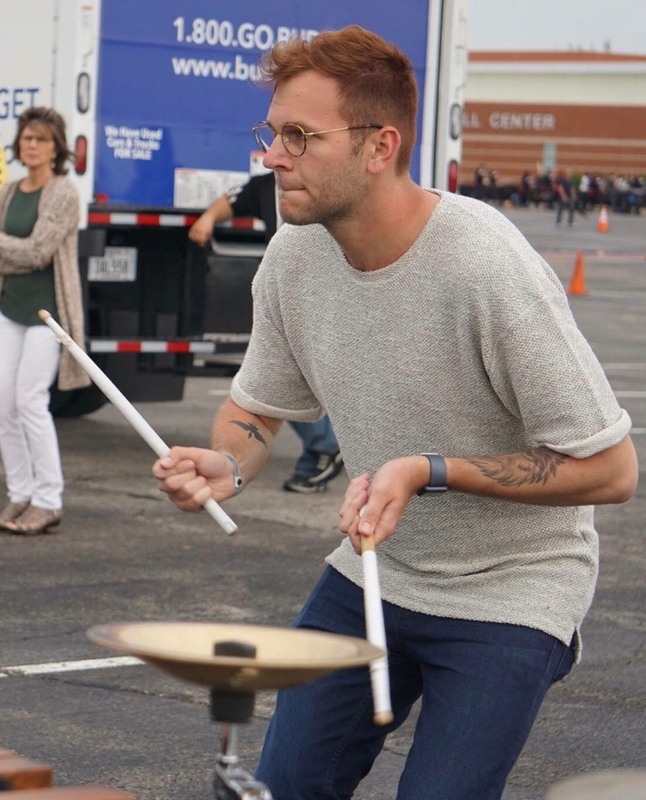 Illuminate: UPFront with Dave Osworth — United Percussion and Arts, Inc. Welcome to part II of Illuminate, our 2018 blog feature. Illuminate continues to shed some light on the key persons involved with United Percussion and provide in depth looks in their words. Our second interview is with Dave Osworth, Front Ensemble Caption Head and Staff Coordinator. Can you tell us about the warm-up process with the Front Ensemble, and how that gets the members ready for the performances? The warm-up process for UPFront is more than just "the lot warm-up". We utilize a simplified exercise packet for building our technique. I have seen a lot of Front Ensemble packets that seem to be complex and convoluted. When I have looked at what the cleanest and most musical Front Ensembles have done for exercises, they were/are playing primarily scales. That’s what we aim to do here with the United Front Ensemble. We take complexity out of our technique program and create an environment that allows for the student to be focusing primarily on the technique rather than a piece of music that rivals the difficulty of show music. For our lot warm-up, we are approaching things differently this year. The members start out by playing independently; this allows our members to start their warm up at their own pace and really get their muscles moving. Our center marimba gives the ensemble a cue that leads them directly from the independent time into one of our four mallet exercises. Immediately following the four mallet exercise, the center transitions the ensemble into our lot tune for the season, “Memento”. Afterwards, we move through some targeted show chunks before coming together with the battery to run sections of the show. 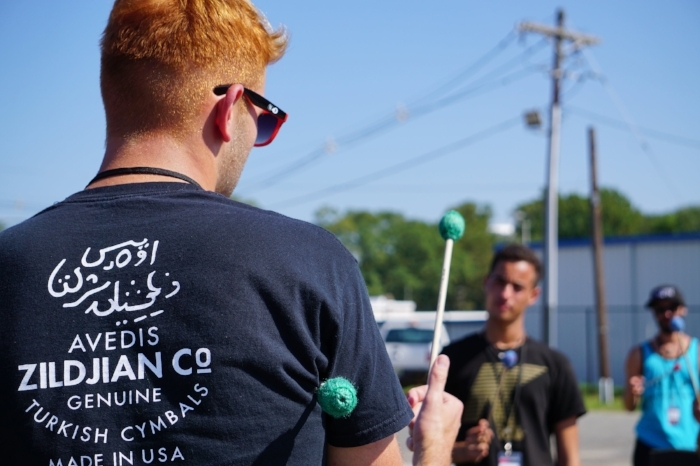 The lot is extremely important to get members focused and prepared for the show. Giving independent time in my opinion is really helpful for our members; they are able to take time to touch on parts of the show that they want to get "in their hands". They are also able to hit what is most difficult for them as performers. As we move through our warm up sequence, the staff may give comments but the members are not being inundated with information. All of our comments are given to individual members in a private manner; we also aim to keep the lot light and relaxed. I don’t want members feeling any tension as they arrive at the floor for the performance. We do everything we can to get them into a calm and focused mindset. In your second year as Front Ensemble Caption Head and Staff Coordinator what has changed the most for you from year to year? The biggest difference is the size of the Front Ensemble staff that I am working with this year. That change has made me really think about the work I do in both the Staff Coordinator and the Front Ensemble Caption Head roles. I have really come into a realization that as Staff Coordinator I have the responsibility of creating a rehearsal environment that allows my staff to do their job to the best of their ability. The success of UPFront is largely due to creating that space for the extremely qualified tech staff to get students the information that they need to be successful. Also as Staff Coordinator, I have spent more time thinking and developing what I want a rehearsal to look like. How do we create a sense of focus and purpose among members so that rehearsals feel both effective and positive? I think that a lot of those things come from having structure going into rehearsal blocks. The energy that you bring being the main voice in the rehearsal permeates through the staff and the membership; and how the staff in the box views rehearsal has a profound impact on the way the rehearsal and group will progress. Organizing such a large section and staff can be a monumental task. How do you stay focused and on track? I take a lot of time thinking about what the schedule should look like prior to coming in for a weekend rehearsal. Coming in with a detailed schedule of what we want to hit will allow me to really focus on helping the group grow rather than having to think about what to move to next. I also like to pull the staff aside before blocks so that they know what I see as the vision is for that part of rehearsal. Making sure that we all have a shared focus for a block in terms of desired outcomes keeps us from straying from the task. With the section and ensemble being so large, that can sometimes be a major challenge. I think it can be important to flag certain things as you go through a block so that you are maximizing your time. For example, if I have the whole Front Ensemble together and we are working on the balance of a musical phrase and I notice that a marimba part isn’t clean and it is not allowing us to actually balance what is happening, I need to move on and flag it for a sub-sectional. It is very easy when working with any Front Ensemble to get focused on the minutiae. How do you see things evolving within Front Ensembles in general in terms of this season and beyond within WGI? I have been involved in WGI since being a member of United Percussion in 2007 and things have changed drastically. There are so many more ensembles now and everyone is playing really well. One thing that continues to evolve and grow in salience to the activity is amplification in the Front Ensemble. There is a need to invest in getting these systems fine-tuned so that the soundscape that is being amplified is well balanced and mixed. Amplification has also evolved to become more mobile as literally moving the Front Ensemble seems to be a thing that many groups are starting to gravitate towards. So, for groups that want to be competitive regardless of class in WGI, it is vital that they have staff members that really understand amplification and electronics in an advanced system for the Front Ensemble. Lastly, what would you say to people coming to the East and Mid-East Power Regionals? The first thing I would say is come check UPFront out in the lot! On a serious note for performing ensembles, make sure that your staff is going into the weekend organized and knows exactly what they need to do when they need to do it. When the staff knows what is going on, it won’t affect the members. Reduce any stress you can off of the membership because the calmer they are, the more they will be able to perform at a high level. towards more clarity. The readability of the show is so vital and Regionals can act as a valuable tool to get that feedback so you can better prepare for your Regional and World Championships. Thanks to Dave for his time and insights! Stay tuned weekly for more guests to come.